In the north eastern province of Santa Fe in Argentina, surrounded by flat fertile fields and nothing much in between, there is a small town of around 25,000 people that on the surface looks like any other. But in fact, Sunchales is a town with a remarkable history and a deep co-operative spirit, which merits a visit from any co-operator who is lucky enough to find themselves in the beautiful country of Argentina. I had the opportunity to visit the official co-operative capital of Argentina as part of my travels around South America, and in the space of three days the amount that I learnt and the warmth of the welcome I received there was overwhelming. A short while before arriving in Argentina, I had contacted Raul Colombetti, the vice president of the insurance co-operative Sancor Seguros, (based in Sunchales ever since it was established in 1945), to see if I could perhaps visit a few co-operatives there. Before I knew it, he had arranged a full intensive three-day programme for me, which included visits to eight schools, a dairy co-operative, a drinking water co-operative and many others. True co-operative generosity in action! I could spend hours recounting all of the inspirational organisations and people that I met there, but for now here is an insight into the co-operative activities in the schools of Sunchales, from which I believe we can learn a lot about co-operative education and youth engagement. There are 16 schools in Sunchales, including two special schools and two rural schools several kilometres from the town. Every single one has a ´cooperativa escolar´, or a school co-operative. Almost all the students of the school are members of these co-operatives, and between them they are engaged in an impressive range of activities, both at primary and secondary level: from creating their own school radio stations and tuck shops; to producing handmade soap and jewellery; to designing leaflets, bags or T-shirts. Every year the co-operatives hold elections where all the members vote students onto the ´consejos´ (committees), and students take on roles such as chair, treasurer and secretary. These committees take care of the administration and practical organisation of the co-operative, learning from a young age how to make collective decisions and work together as a team. But in reality, the students told me that all the members are incredibly active in the co-operative, not just the committee members, and it was clear that in all the schools the co-operative had a large presence in the school. 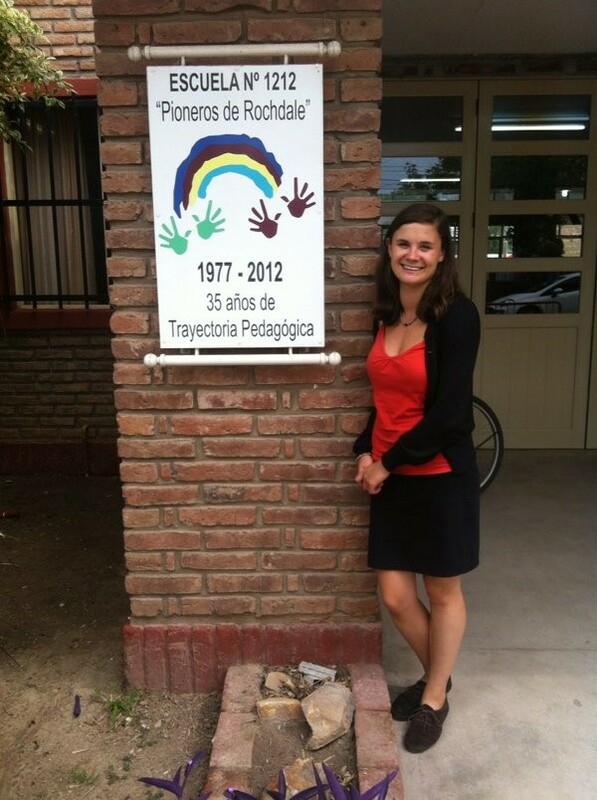 The co-operative values and principles and co-operative symbols were painted in rainbow colours across the walls of many schools, and one primary school was even called ´Escuela de los pioneros de Rochdale´ after the 28 textile workers that opened the first successful co-operative in the world, thousands of kilometres from this small school in an Argentinian town. I was also struck by the way all the schools are united through the ´Federacion de Cooperativas Escolares Sunchales´. Every school votes for two representatives from their co-operative to be part of the federation. With the support of the Fundación Grupo Sancor Seguros (the educational and development arm of the insurance co-operative), both financial and otherwise, the youth-led federation unites the schools by organising local social events, as well as international youth exchanges where students from Sunchales meet young co-operators from other countries such as Brazil, Italy and Spain. The fact that the federation is completely run by the town´s students of all ages, is an impressive example of co-operative learning in practice, and the young people involved are clearly deeply motivated to create a thriving and united youth co-operative movement in the town. After my three-day visit, I have seen that Sunchales truly is a town where co-operation is written into its DNA. Just as the pride and dedication of members of Sancor, the town´s dairy co-operative and the oldest co-operative in the town, established in 1929, demonstrated the richness of Sunchales´ co-operative history, so the co-operative spirit and passion from the young people that I met in the schools provides certainty that the town´s co-operative movement will only get stronger and will continue to inspire future generations of co-operators in Argentina and beyond. This entry was posted in Co-operatives and tagged Argentina, co-operative business, co-operative schools, Sunchales. Bookmark the permalink.